Why is Record Genie cleaning better? The best record cleaning machines available on the market are from Audio Desk Systeme (made in Germany) and Klaudio (made in Korea) and they use ultrasonic cleaning technology and take record cleaning to a higher level. Ultrasonic waves are generated in the distilled water in which the record is partially submerged and rotated, causing an effect called "cavitation" where tiny bubbles form and implode on the record surface and deep into the grooves. These tiny bubbles remove dirt and grime, right to the the bottom of the groove where even the finest brushes can't reach. It really is a better way of cleaning, and ultrasonic cleaning has been used commercially for many years to perfectly clean surgical and dental instruments and jewelry, but the technology has only more recently been adapted for safe use with more delicate vinyl records. The "Audio Desk" machine from Germany was the first automated cleaner to use ultrasonics in 2009, and the "Klaudio" machine from Korea is a 2013 entry to the market. For more details see Technology and for pictures see Gallery. Store Locations partnered with Record Genie set their own retail prices, typically $2.75 for single cleanings and $5.00 for double cleanings, per record, and By Mail prices are the same. It's affordable if you understand the cost of the equipment required to offer the service, the time involved, and once you've experienced the results that ultrasonic record cleaning can offer. The ultrasonic record cleaning machines are simply too expensive for most people to buy for personal use, and the German and Korean machines Record Genie uses are the best available on the market. Record Genie's professional cleaning service lets you affordably enjoy the benefits of playing ultrasonically deep cleaned records without the major up-front investment of buying your own machine. You can spend more of your valuable time listening to your records or looking for more, not cleaning them yourself! What kind of records can you clean? My 7" or 10" records? How about 78s? Both of the ultrasonic record cleaning machines that Record Genie uses have been designed only for 12" vinyl records. Only 12" vinyl records can be cleaned in the Audio Desk machines, but if you have 7" or 10" records to clean, then don't despair, as Klaudio now offers 7" and 10" to 12" adapters, and Record Genie purchased them as soon as they were made available. Other records like 78's and special one-off acetates are made of different materials that are too fragile to safely be cleaned in the automated ultrasonic machines. My stereo system didn't cost thousand of dollars, will I really hear a difference? The truth is that as magical as vinyl records are as a playback medium for many people, they have always been difficult to keep clean, and a carefully maintained and clean record is always going to sound better on any system. If you are lucky enough to own a more expensive system, then you'll be able to hear even more music revealed from the depths of the ultrasonically deep cleaned grooves, especially when playing better quality pressings and recordings.﻿. The bottom line is that you should trust your own ears, and what you hear before and after Record Genie cleaning will tell you all you need to know. See the "Try It Out" special offer By Mail with three records you are most familiar with, listening on your own system. How do I get my records cleaned by Record Genie? Record Genie has partnered with Boston area hi-fi and record stores who want to offer their customers ultrasonic record cleaning. Each store sets their own retail prices, typically $2.75 for single cleanings, and $5.00 for double cleanings, per record. Ideally each store would have at least one Record Genie Cleaning Clinic for a few hours every month (if there is space to set up equipment) which allows for convenient "while you wait" cleaning while you browse for that next vinyl gem or hi-fi treasure. Boston area record shows and other special events offer another chance to get your records cleaned while you wait, see News & Events for more information. Drop Off & Pick Up service is available through stores. Customers can leave their records in an individually marked and sealed package or Record Genie mailer, to be collected and returned to the store after cleaning, typically in 1 week or less. See Locations. 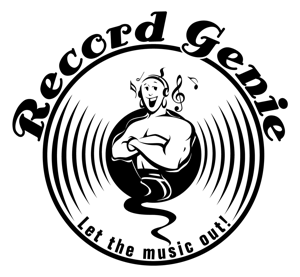 If you have lots of records to clean or are part of a club or audio society, you can request a visit from Record Genie, just Contact Us. Each visit is quoted and scheduled by Dave, based on number of records, travel time and distance, parking, ease of setup etc. Stock can also be cleaned on-site for record wholesalers and eBay dealers. Don't live in or visit the Boston area? No problem, it's surprisingly affordable to send your records by USPS Media Mail to have them ultrasonically cleaned. Single cleanings are $2.75, double cleanings are $5.00, per record, plus shipping. Just use the By Mail page, or if you prefer eBay, search for "ultrasonic record cleaning" to find RecordGenieUSA. Are you ready to hear the Record Genie difference? Check Locations to see the Boston area hi-fi and record stores that offer Record Genie services. Don't live near Boston? Send your records By Mail to have them cleaned. Do you still have questions? Ask away! Please Contact Us to get in touch with Dave at any time.